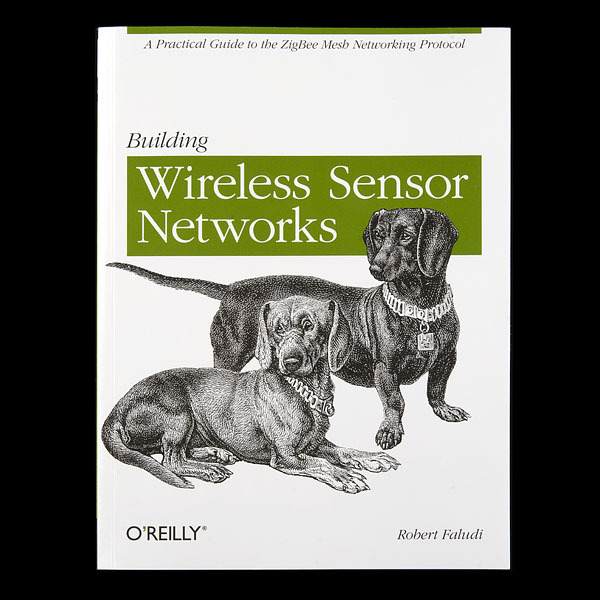 Uhg, I ordered this book with 3 series 1 XBee boards, only to find out in the first chapter that I just wasted $60+ on hardware this book does not cover. Yes, if I read down far enough someone else commented on this, but as You are very likely going to sell this book paired with at least 2 Xbee boards it seems ridiculous to me that you don't say something in the description about it. Here, I will help! !!!!!!!!!!!! !THIS BOOK ONLY COVERS SERIES 2 XBee MODELS!!!!!!!!!!!!!!!!!!! Feel free to copy and paste that as you like. On the plus side, My copy doesn't appear to have any of the printing errors mentioned below, and as an added silver lining, 2 of the 3 XBee boards that I ordered never made it into the box you sent, so hopefully I can get a hold of someone to swap those for series 2 units and I'll find some use for the series 1 unit i have. Thought this might be helpful to people like me who like to order the book and the parts at the same time. You might also want to pick up an Arduino and an XBee shield. 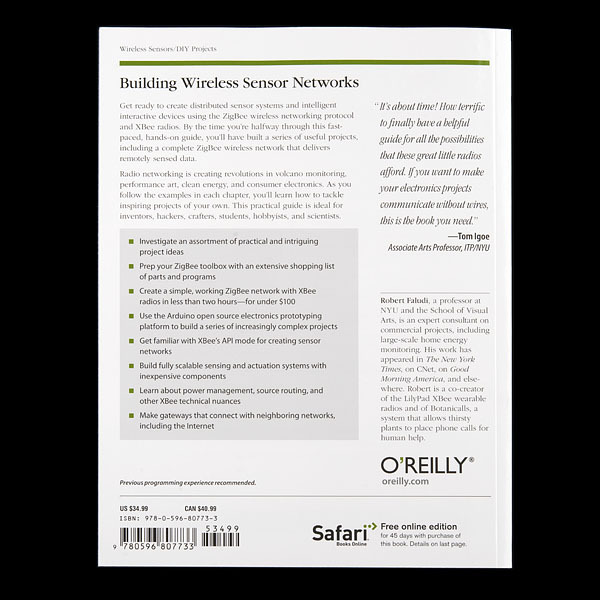 I got a copy of Faludi's BUILDING WIRELESS SENSOR NETWORKS from SparkFun with my Xbee starter kit. While it's been very useful it does have a significant production flaw: some character strings, particular in many of the examples, are replaced with a character that looks like a squared spiral. This is pretty clearly a printing problem not caught by O'Reilly, a publisher whose books are generally very good. For example, Table 2-5 on page 51, all the fields under the Parameter column are unreadable. Just below that you can find "As a final step, use the XXXXXX command to write the new configuration" where X is the squared spiral character. I can usually figure out what the author is talking about by cross-referencing the XBee manual from Digi, but it's a pretty big flaw for a $29 paperback. I've already ordered another copy from Amazon.com, since I'm assuming the entire batch from SparkFun probably has the same issue. But it might be a good idea for someone from SparkFun to check their supply. My copy has the same problem too ... everything printed in italics is unreadable. Very frustrating and difficult to figure out what the heck is going on. I called O'Reilly and complained and they sent a replacement book (free) that was printed correctly. I'm a happy camper now, but these books should have never left the publisher and been sent directly to recycling. Also, the electronic copy (PDF) of this book is up-to-date and displays the italic text correctly. SparkFun should check their physical inventory and return any defective books back to O'Reilly for replacement. Sorry to hear you received a bad print. The books in inventory look fine. It looks like a super rare issue O'Reilly had with one of their batches. If anyone ever sees this issue again, please make sure to email us at techsupport@sparkfun.com, so we can help you. i've been doing intermediate hacking with arduinos for three years. i don't think this is the best book out there. a group of us wasted a few weeks and couldn't get the examples to really work. we had serious broadcast problems / buffer over-flow. the version of XTCU he covers is already out dated. didn't really cover what i wanted to do which was one master and multiple slaves in transparent (command) mode. i think he should have skipped the advanced (API mode) chapter and created some better lab-based examples that the reader could use to base other projects on. that being said - the Xbee S2 is a complex product and there seems to be a shortage of good information out there for those who want simple arduino apps where the xbee is configured in command mode. it's an ok book but i wouldn't recommend it to a friend. i've ordered the other book by Titus on Xbee lab. I'll see how that works. Anyone who has used this book want to share what kind of background this book assumes the reader has? Does it start off with explaining network theory, or does it explain basic circuits first? It would be useful to have a networking reference text (I like to have reference books in paper form, I also print out data sheets, call me old fashioned), but I don't need something that explains ohms law for the bazillionth time, or which end of a soldering iron to hold. 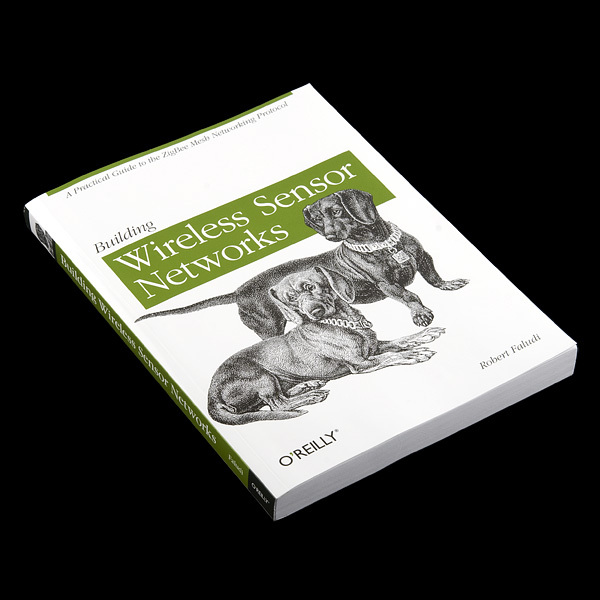 The book is intended to be a practical guide to creating wireless sensor networks using the ZigBee protocol. It's written with hobbyists, students, makers, hardware hackers, designers, artists, and prototypers in mind. While there's sufficient references to keep the adventurous beginner moving, there's plenty of meat on the bone for those experienced with making things. For example, the first chapters aren't about theories or circuits at all, they're about what to buy and configure to get up and running quickly. Guessing from your question that the book would work well for you, so if you get it, let us know what you think. The maker of Green Goose commented that XBee was too expensive for their application and they were using 915 MHz (car fob) technology. Does anybody carry lower cost components than the Xbee? Why would 915MHz be cheaper than 2.4GHz? On page 95 it says, "your coordinator radio must use the API firmware.. because I/O data is delivered only in API mode. So that means that the coordinator is the one doing the A to D conversions, right? However on page 98 under "Configure your router XBee" item 12 says to "Enter ATD02 to put pin 0 in analog mode". That makes it sound like the router is doing the A to D... Am I missing something? The router is indeed doing the analog to digital conversion. The coordinator that's receiving the messages from the router in this case needs to be in API mode because it has to generate API IO frames to deliver the structured data that came from the router radio. What does dogs have to do with Xbee networks? Man, this is an excellent book. I read about the first 100 pages and was able to get my Series 2 xbees running without a hitch. Excellent read. I've been waiting for 6 months for this book to be released. I can't wait to give it a read. It is entirely based on the Series 2. We to tend to steer people towards the Series 1 modules for their ease of use and because for most of what our customers are doing Series 1 works just fine. If people need or want Series 2 and haven't used them before we tend to recommend the book as well. I just looked at this book at my local Borders book store. This book only covers the Series 2 XBee boards. It does not cover the Series 1 XBee boards. They make this disclaimer explicitly in the very first chapter. Stupid comment... given sparkfun are trying to sell the book. Google Books has a nice, long preview of the book so you can read some of it. Kind of like a try it before you buy it deal. got this book a few weeks ago, LOVE IT!